Why are our controllers are the best value for your money? Buy what you need now and add modules later. We always use fireproof all metal housings. Built with all UL marked and certified electrical components. All of our controllers are 100% GFCI / GFI tested. Our boil controllers are the easiest way to switch from propane to electric. Because you really want to add a RIMS tube to your GOTT cooler mash tun. All of our controllers are complete, all the way down to the power cord! And why would someone sell a controller without a power cord? Look closer at some of our competitor’s offerings and you’ll understand…. While you are here, please check out our failures happen page to see why we will always build controllers in 100% metal housings! Brew-Control started with a belief that most homebrewers don’t want a total solution for their electric home brewing systems. But instead, most homebrewers want to spend what their budget can afford now and then grow later. So, instead of going ‘all out’ on a $2,000+ system, most homebrewers go with an electric controller for better mash control or they decide to replace their expensive propane fired brew pot with an electric brew pot. 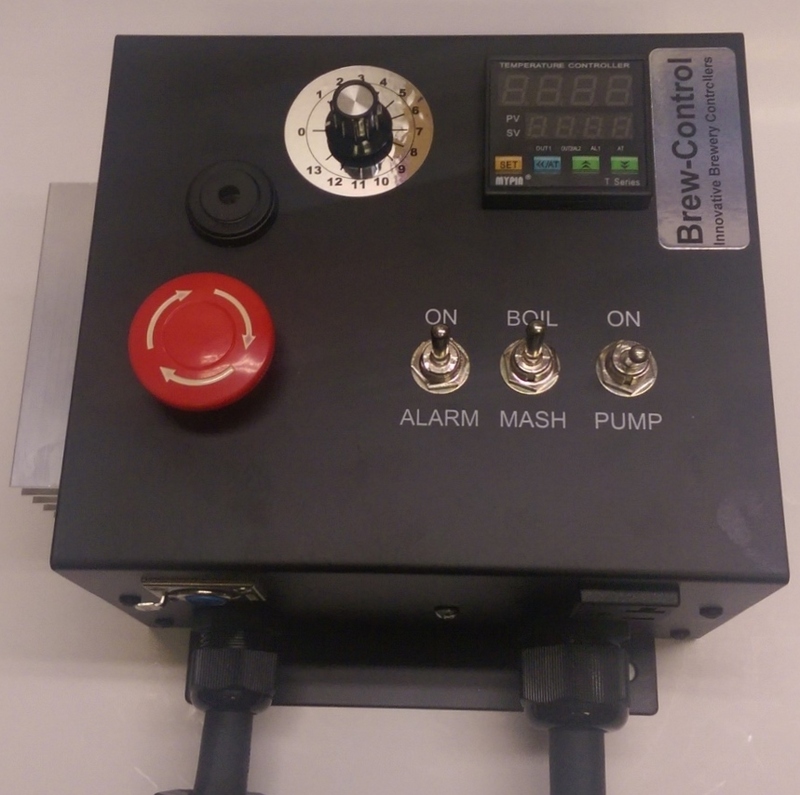 Many of our customers started with a 120V mash controller then added a 240V boil controller later. Or they started with a boil controller and then added a mash controller later. This allowed them to spend their hard earned cash monthly instead of making one huge purchase. But even our larger controllers bring excellent value compared to their cost. Want to brew better beer? Most of us started brewing with extracts and I’ve tasted some great extract beers. But it doesn’t take long to figure out that you can move on to mashed grains to save money and to gain more control of your brew recipes. That first step away from extract brewing is almost always single step infusion mashing in a GOTT Cooler type insulated mash tun and this is a great improvement over extract brewing. But you can only go so far with an insulated mash tun. Some recipes call for a multi-step mash, with each temperature step’s temperature and time is critical for developing the flavor profile and mouth feel of your beer. A PID base mash or brewery controller like ours is capable of managing even the most complex multi-step mash profile. How about better temperature control? Temperature control is always a shot in the dark while mashing in a GOTT Cooler type insulated mash tun. I know what I used to do – When I mashed in a GOTT cooler I would set my initial strike water to 170F, incorporate my grain and then measure my temperature. And it would always be low – somewhere in the 132F – 135F range. So, I’d stir in hot water until I reached 145F, put the lid on my mash tun, cover with a few blankets, wait for an hour and hope for the best. I made some pretty good beers this way but nothing spectacular. This problem is solved with a good mash controller like our RIMS Tube / Mash Tun controllers. Plus, if you use a RIMS Tube you can keep your cooler because you can circulate wort from your existing cooler through your RIMS tube and back into your cooler. The real advantage of a PID based controller like ours is you can start at 145F, or whatever your recipe recommends and stay at that temperature through your entire mash cycle. Then you can vary over time until your temperatures are dialed in and get predictable results batch after batch. The bottom line is the amount of temperature control is amazing with a good controller. Multi step infusion mashing is easy too – just watch the time and change the mash temperature on your controller as the recipe you are following dictates. With a little experience and knowledge of how fast temperature changes move through your mash tun, you can tackle the most complex multi-step mash profiles with one of our systems. Woudn’t it be nice to brew inside? You know the drill, you want to brew this weekend but it’s raining. Or it’s 20F outside, or here in the South it’s 98F degrees and feels like 120F because of the 80% humidity!!!! It’s easy to mash inside but you can’t put your burner in the house. The right answer is to brew in your garage or in your kitchen, but not with a propane burner full on! Home Brewery Equipment like our Boil Controllers and our more capable BIAB Controllers, HERMS Controllers and Full Brewery Controllers solve all of these problems. Because they are electric you don’t have to brew outside and when the temperature is extreme you can just partly close your garage door. Some customers have even set up basement breweries with our equipment. Just make sure you plan for plenty of ventilation for your basement setup because a full boil will pump a lot of water into the air. It would be great to stop using expensive propane! Propane is the obvious solution to boil your wort because most of us already have a propane grill or turkey fryer. But we don’t cook burgers for a solid hour and I believe that if most home brewers understood their propane cost they would be searching for a better solution after their first or second tank refill. I did a quick experiment one day – I weighed my propane tank before and after a full brew day and figured I had somewhere around $5.00 of propane in that one 5 gallon batch of beer! This was on a calm, moderate day with very little wind blowing. And although I didn’t take the time to measure propane usage on a wind day, I know my propane usage has to go way up when the wind is blowing. One issue with propane is only about 25% of the heat generated by propane heats your wort. The rest goes straight up the sides of your pot and into the air. This is because the heat source is on the outside of your pot, and because your propane flame needs airflow, that same airflow carries much of your heat away from your boil pot. But an electric boil pot uses a submerged heating element – the heater is inside your pot. This means that 100% of the heat generated by the heating element heats your wort, and all you have left are evaporation and radiation losses with electric. Also, it’s no coincidence that our 220V/240V Boil and Mash Controllers, and our more capable BIAB Controllers, HERMS Controllers and Full Brewery Controllers are all designed to run on 30 Amps, the same current your electric dryer is designed to run on. Many of our customers plug their setups into their dryer outlets then plug their dryers back in after brew day. We even sell dryer extension cords – up to 50 feet so you can run your dryer power out to your garage. Plus we sell a 10 foot dryer extension cord to extend your dryer outlet from behind your dryer so you don’t have to climb over everything to switch between your dryer and controller.